The sun is reduced to a ring of gold against the black sky as the Moon slips between it and Earth. 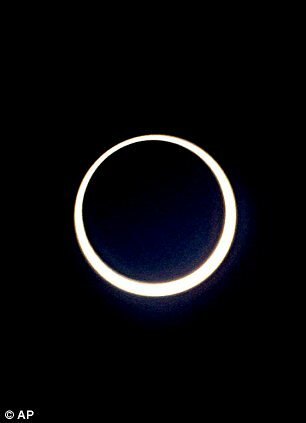 This solar eclipse yesterday lasted for 11 minutes and eight seconds, setting a record that will not be beaten until December 23, 3043. 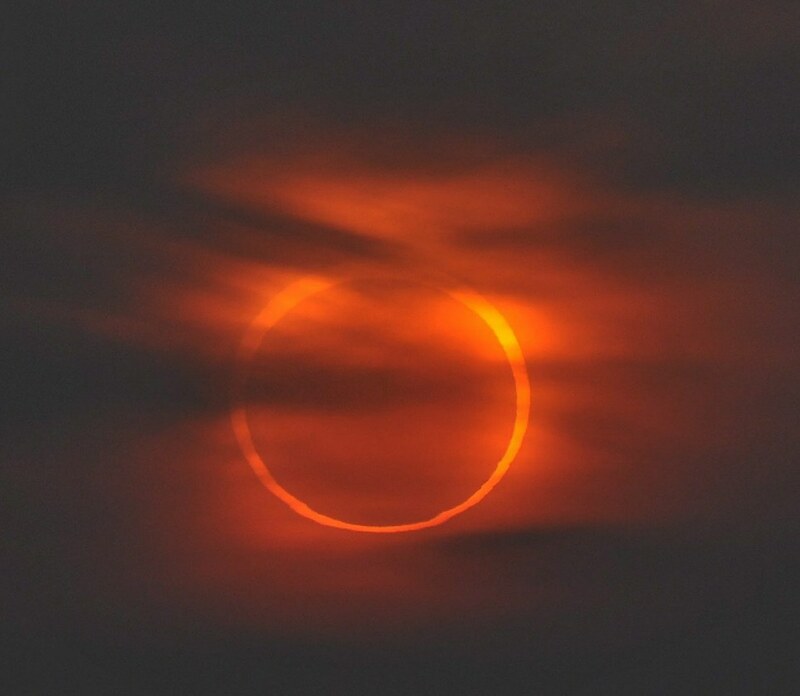 The skies over Hongdao, China, where the spectacular 'ring of fire' could be seen. 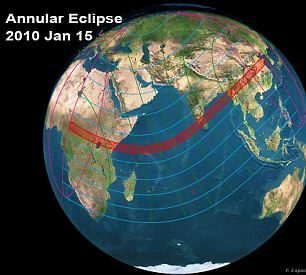 This image show a total solar eclipse which passed over Europe and the Middle East, and into India. Such events, which only blot out the middle of the Sun, are known as annular eclipses. They occur about 66 times a century and can only be viewed in the narrow band on the Earth’s surface below their path. Yesterday’s light show began in Africa before crossing the Indian Ocean, where it reached its peak at about 7am GMT. It then continued into Asia where it could be seen in the Maldives, southern India, parts of Sri Lanka, Myanmar and China. 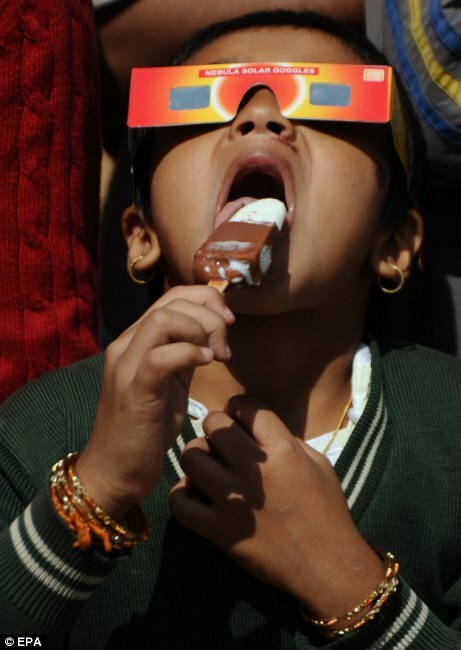 In other parts of Africa as well as the Middle East and Eastern Europe, skywatchers were treated to a partial eclipse. In India, the phenomenon gave an extra auspicious edge to the Kumbh Mela festival, where thousands of people immerse themselves in the Ganges river, an act believed to purge all sins. 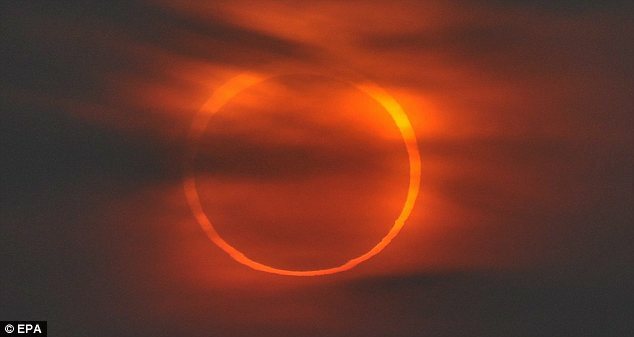 ‘Taking a holy dip during the solar eclipse is a very pious act,’ said Hindu priest Babu Ram Sashtri from the banks of the Ganges. The eclipse sent sea birds in Sri Lanka looking for a place to roost for the night – shortly after lunchtime. 'Many amateur astronomers have taken time off work and spent a lot on money on travel to see it,' said Lin Qing, head of the Sheshan Station of Shanghai Astronomical Observatory in China. 'We will travel across China simply to witness the magnificent astronomical phenomena,' she added. The eclipse, the first of its kind to cross over Sri Lanka since 1955, sent sea birds along the oceanside capital of Colombo looking for a place to roost for the night, shortly after lunchtime. A pelican looped over the city as the skies darkened from the north and the eclipse neared its peak. 'Wow, it's marvellous,' said an army officer, who was on security duty in Sri Lanka's capital Colombo. 2009. The next one will happen May 20, 2012. Not every eclipse of the Sun is a total eclipse. On occasion the Moon is too small to cover the whole of the Sun. This is because of the Moon's orbit around Earth which is oval or elliptical in shape. per cent variant makes its apparent size, from our perspective, vary by the same amount. 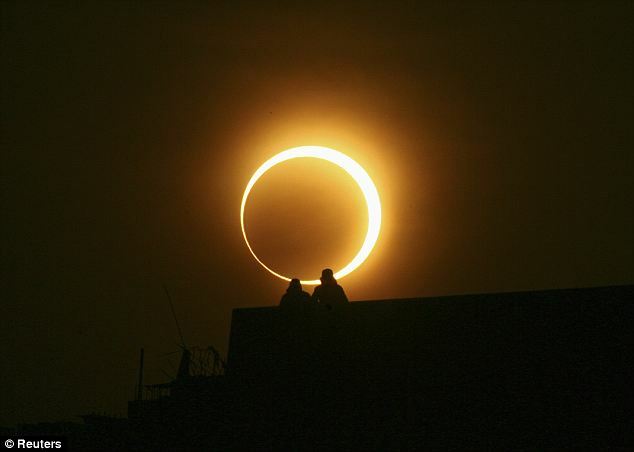 It is this effect that leads to the difference between total and annular eclipses. When the Moon is on the near side of its orbit, it will block out all of the Sun's light resulting in a total eclipse. This will only be experienced at a specific point on Earth where a shadow cast by the Moon, called an umbra, reaches our planet. However, if an eclipse occurs while the Moon is on the far side of its elliptical orbit, it appears smaller than the Sun and can't completely cover it. 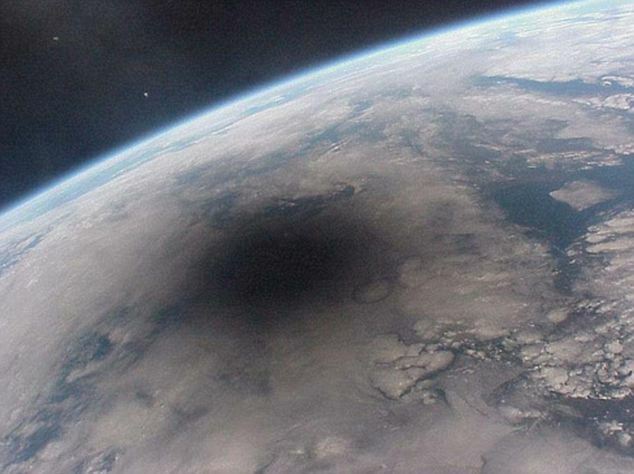 When this happens, the umbra cannot reach Earth and an antumbra shadow is created over the planet's surface.